Moodle gives instructors the option of hiding items from students, and then making them visible at a later time. 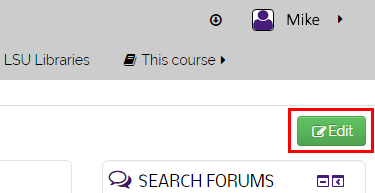 Links to hidden items show up as red text with the indicator (hidden) on the Moodle page for participants above the role of student (such as instructors and teaching assistants.) Specific items and entire content areas can be hidden by clicking on the Hide icon associated with that item or content area. For hidden items, the Hide icon converts to the Show icon. 1. Log into Moodle and select the course. 2. Turn editing on by clicking on the Edit button at the top right of the page. 3. Find the week or topic to show students and click on the Edit menu to the right of the name. A dropdown menu will appear; click the Show icon. 4. Students will now be able to see the link to the item that was previously hidden. In the instructor's view, the red text link will change to black and the Show icon will then change to the Hide icon.